About as simple as they come, 2018 Leaf Draft Football operates on the low-end side of Leaf's pigskin portfolio. Issued in a retail blaster format, each box includes two autographs. The pre-draft 2018 Leaf Draft Football highlights players that are expected to be taken in the 2018 NFL Draft. Just as in past years, the 2018 Leaf Football checklist features a deep assortment of talent on both sides of the ball. Collectors are especially excited for the incoming rookie crop as the '18 class appears to be loaded with talent, especially at quarterback and running back. Also like past years, the Autographs don't come in packs, and instead are found separately in the blasters, already in toploaders. While not numbered, Gold versions are limited to less than 150 copies. 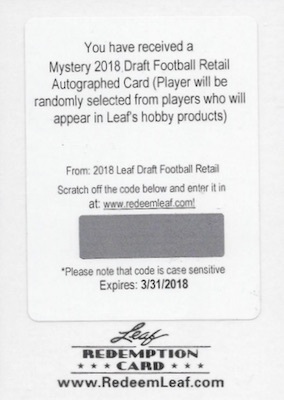 Expanding the selection, the Mystery Redemption Autographs set yields a random signature from the subjects found in Leaf's Hobby products. 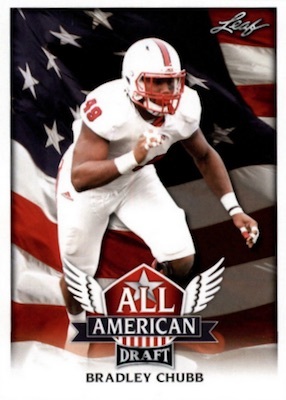 The main set features 59 base cards because card #38 for Mark Walton does not exist. As a result, card #39 for Mason Rudolph is a double print. Inserts include All-American, Field Generals and TD Machines. Also, all base and inserts have Gold parallels. 2018 Leaf Draft Leighton Vander Esch Rookie Auto Autograph HOT Card !!! 59 cards. 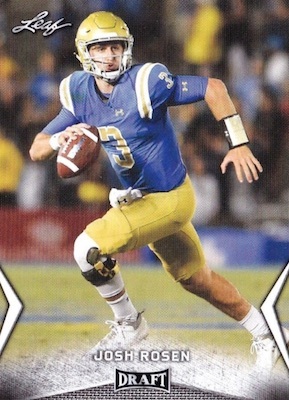 Card #38 for Mark Walton does not exist. Card #39 (Mason Rudolph) is a double print. PARALLEL CARDS: Gold (less than 150 copies). 64 cards. Randomly selected from the list below. Shop on eBay. Leaf has stated that the expiration date of 2018 is an error and it should list 2021. Here are the top deals on retail blaster boxes currently listed on eBay. 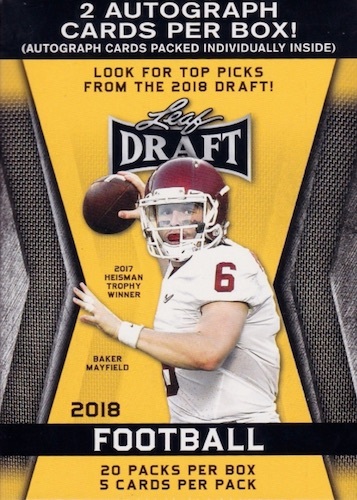 cards are out on ebay – still no checklist ??? As soon as we have the checklist, it will be added. 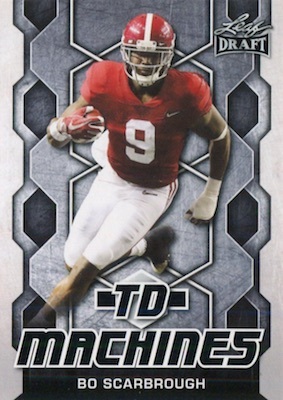 terrible set – redemptions are a joke and the cant even put the college name next to the player on the checklist ? I think they purposely did not put out a checklist because they had none of big names so to speak signing regular cards. Had a lot of damaged cards in the case i purchased. The only thing I liked was the design . Would have been NICE TO KNOW that card #38 does not exist BEFORE I bought 17 boxes trying to look for it!!! PROS: I like the design and I like that the blaster boxes come with 2 autographs already in top loaders. CONS: I keep getting the same cards over and over and over. Occasionally I will get one of the Gold cards I need to complete the parallel sets, but the algorithm is terrible. This is not a bad set but it lacks the Saquon Barkley RC. Horrible product. Cheap Base cards and the autographs being put in separately are a list of no names. Waste of money and time to open. This is the type of product that drives people away from the hobby. Sure, the quality of the card stock is pretty low, but the photography of the set is nice, and the inserts don’t look half bad. Also, with no numbered inserts, I could see people being able to complete a master set in less than 5 boxes. 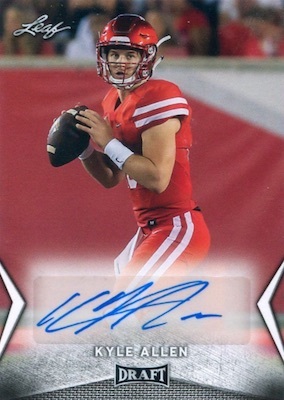 The list of autos is lackluster, but you technically do have a small chance at a mystery redemption, and the in-box autos have some breakout player, most notably Phillip Lindsay and Leighton Vander Esch. 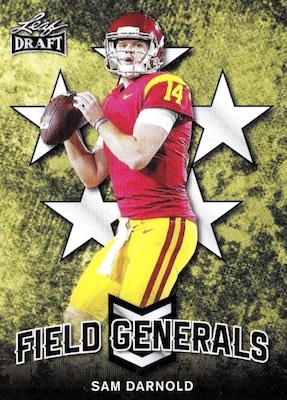 Overall, it’s a fun rip that gives you a ton of cards and familiarizes collectors with this season’s rookie class.